DJcity has teamed up with Geffen Records on a remix contest for Avicii‘s new single “Without You” featuring Sandro Cavazza. The infectious progressive house track recently debuted at No. 18 on Billboard’s Hot Dance/Electronic Songs chart. Geffen Records was founded in 1980 by industry heavyweight David Geffen. Earlier this year, Universal Music Group relaunched the label with a roster that includes Avicii, DJ Snake, Lil Jon, AlunaGeorge, and Gryffin. The winning submission will be released by Geffen Records as an official remix. The winner will also receive a cash prize of $5,000 and be featured on DJcity’s blog and social media. Get more info and enter the contest here. Avicii’s new single “The Nights,” along with the official remix by Felix Jaehn, is now available on DJcity. The track continues the Swede’s experimentation with the country-EDM sound. After teasing it on Friday, David Guetta has officially released his new single “Lovers on the Sun.” The track features rising vocalist Sam Martin and co-production from Avicii, Giorgio Tuinfort, and Frederic Riesterer. Dozens of people were taken to the hospital from an Avicii show at TD Garden Wednesday night for problems with “drinking, drug use, and heat in the arena,” reports local news station CBS Boston. Boston EMS told the station that 36 young men and women were taken to local hospitals and another 50 people were treated inside the venue. Their Deputy Superintendent said that none of the injuries appear to be life-threatening. 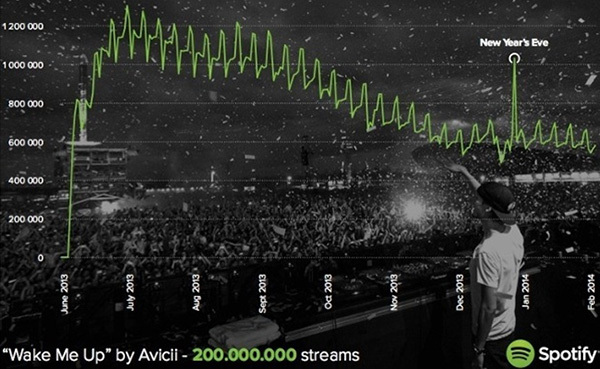 Avicii’s “Wake Me Up” has reached 200 million streams, making it Spotify’s most-streamed song of all-time. The Swedish producer’s Aloe Blacc-assisted hit surpassed “Radioactive” by Imagine Dragons, which takes the number two position at 182 million streams.